Raw Chocolate Truffles are made from only 4 all-natural ingredients and are completely vegan and dairy free. So simple and easy to make and in less than five minutes, you can be sitting down eating these lovely little chocolate balls. I’m not on the sugar detox anymore but I’m still not eating any kind of processed sugar. The only sugar I am eating is natural from fruit about once a day. On the detox, fruit is excluded and I went a full 2 days without eating any of it. This was totally cool with me because normally I’m not the type of person that has to have a piece of fruit every day. However, on detox day 3, I went to the Fresh Market and they had the complete nerve to put on display some of the most gorgeous looking (and smelling) organic peaches and apricots I’ve ever seen in my life! Really Fresh Market?? Don’t you know I’m avoiding fruit? Jerks. Anyhow, I bought a big bunch of the pretty forbidden fruit and was noshing on fresh peach slices in heavy cream that very night. Heavenly! 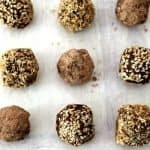 This recipe for Raw Chocolate Truffles is a healthy sweet snack with no additional sugar aside from what’s naturally found in the dates. These truffles are also made with organic raw cacao powder, which is considered a super food power (or something like that). Super food or not, organic raw cacao powder has become my savior during my whole anti-sugar regime. I love chocolate and every night I would eat a small handful of dark chocolate almonds to satisfy my chocolate craving. I thought I was making the healthiest desert decision ever, which I guess is somewhat true. I mean, it’s better than a piece of cake or ice cream, right? Well, one day (okay I think it was the first day of the sugar detox but who’s counting? ), I felt the need to stab someone if I didn’t get a dark chocolate fix fast. I knew I couldn’t eat my chocolate almonds so I grabbed my bag of organic raw cacao powder and put a heaping spoonful of it in my afternoon coffee. First sip reaction, this tastes so much like unsweetened cocoa (because it is) and tastes like crap. I now fully understood why sugar is always combined with chocolate. Never one to allow the first taste of something to determine whether or not I truly like it, I took a second sip. Much better and I started realizing that this could actually solve my no sugar chocolate dilemma. I get my chocolate and the hubby J can relax and have no fear that I might hurt him when I go into a I-Need-Some-Chocolate-Now rage. It’s a win-win for all! 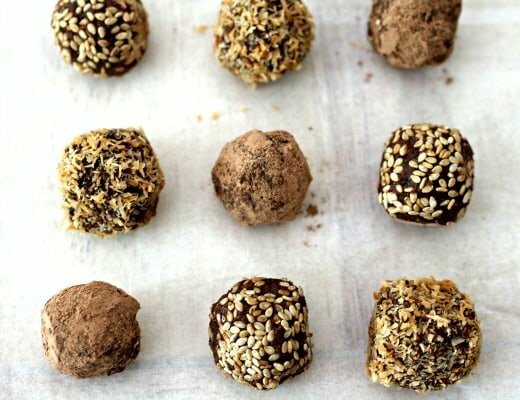 These Raw Chocolate Truffles will satisfy any chocolate craving. Roll them in cocoa powder, toasted sesame seeds, unsweetened toasted coconut, or whatever your sweet tooth desires. 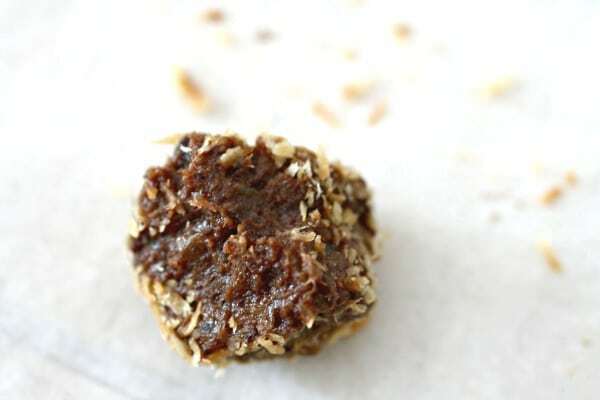 Healthy raw truffles are made in 5 minutes, from only 4 all-natural ingredients, and are completely vegan and dairy free. Place raw Brazil nuts in a food processor and process until finely ground, about 2 minutes. Add dates, cacao powder, vanilla extract, and optional ginger or orange flavored liqueur. Process for another 2 minutes or until mixture is fully incorporated and no lumps remain. Roll mixture into 1 inch round balls and roll balls in assorted toppings of coconut, sesame seeds, cacao powder, and/or mini chocolate chips. Karrie, at least you are trying hard to be really good…I’m just THINKING about being really good! These truffles look delicious and look like they would satisfy any chocolate/sugar craving! Thanks Thao. After eating that big piece of cake the other day, I’m back to thinking about not eating sugar and it’s not working. Haha! Girl, the fact that you even went on a sugar detox and lasted that long is amazing!! Good for you! Everyone deserves some good old fashioned cake once in awhile, so I’m glad you got to enjoy that! 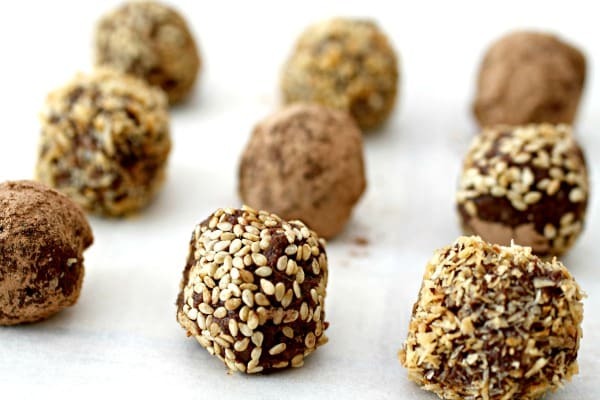 I can’t believe these truffles are healthy – they look so decadent and sinful; I must try these!! Thanks for the support Beeta. Let me tell you, that was some good cake but now I want to eat it every night. I was going to save some of the fruit and do a classic fruit tart but I ate it all. My bad! PS- Karrie, you ALWAYS crack me up… thanks for being a reliable source of laughter! Love little tasty bites that can satisfy my chocolate cravings This looks so good!! Thank you Cathleen and thanks for stopping by too! Love how healthy this is!!! Or seemingly healthy, if they aren’t -you need not to tell me! Anne, the good news is they are healthy so eat up! Such a luscious and scrumptious dessert – this is I call the indulgence! I love this kind of sweets. The only one issue with them that I always forget they are still loaded with fruit sugars. The better option anyways, right?! OK, since I’m on a diet, send please just a dozen of these lovely truffles please:)) Well done! Karrie these look amazing! And the fact that they’re kinda good for you makes them even better! Must definitely give them a try! Thank you Erika! You can eat a whole plate of them because they are healthy. Hahaha!